We want to announce the officially launch of our Maui vow renewal website Vow Renewals Maui. 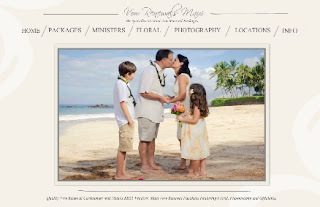 Vow Renewals Maui is a sister site to Simple Maui Wedding focused strictly on vow renewals. The site is much like the Simple Maui Wedding website in the sense that it has a great deal of the same functionality, but will have many excellent photographers that Karma Hill, of Good Karma Photography, has hand selected because of their beautiful work. No, Karma won't be doing the shooting for this brand, but she will make sure that Vow Renewals Maui maintains an excellent quality standard. When navigating through the Vow Renewals Maui website you are given the ability to see just what you are going to get before you book the package. The site offers an extensive locations page for choosing the beach location for your vow renewal including: photos, backdrop description, if the location is best for morning or sunset, if there is available parking and if there are restrooms available. The floral selection page describes and displays photos of each of the multiple petite bouquets exclusive to the site, and leis available for the lei exchange portion of the ceremony. The minister selection page provides photos of each minster, descriptions of their faith/beliefs and information so customers can get to know each minister. The photographer page provides a portfolio of each photographer so the customer can choose the style of photography that best fits their personal style.